A German VW Typ 82 leichter geländegängiger Personenkraftwagen (Kfz. 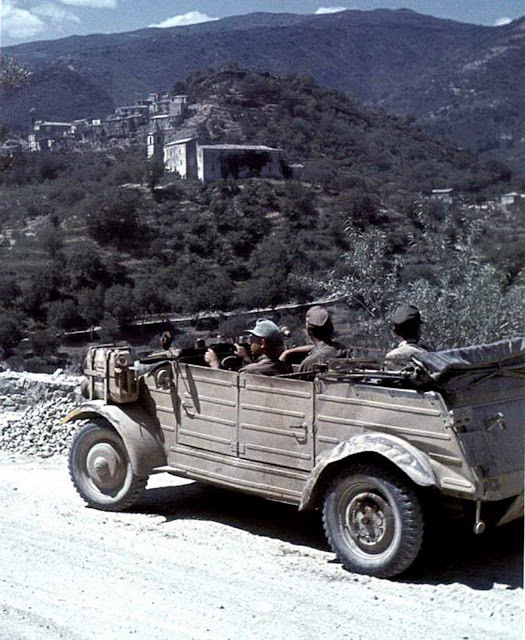 1) "Kübelwagen" in front of the backdrop of a mountain village in San Piero Patti, Messina (Sicily/Italy), with the castle-like structure of Convento dei Carmelitani, 1943. This Kübel is equipped with the mounting for an additional gas jerrycan that is affixed to the left mudguard. The Wehrmacht-Einheitskanister, as it was known in Germany, was first developed in 1937 by the Müller engineering firm in Schwelm to a design by their chief engineer Vinzenz Grünvogel. A similar design was used in 1936 during the Spanish Civil War, where they had a company logo for Ambi-Budd Presswerk G.m.b.H. By 1939 the German military had thousands of such cans stockpiled in anticipation of war. Motorised troops were issued the cans with lengths of rubber hose in order to siphon fuel from any available source, as a way to aid their rapid advance through Poland at the start of the Second World War. The British quickly discovered the benefits of the German 20 L Wehrmachtskanister and copied them. The British nickname for Germans was "Gerries" - hence "Gerry cans" or as better known Jerry cans.